USF, Coast Guard and Feinberg…Who You Wanna Believe? Bet ya didn't know I was an oceanic expert, did ya? When it comes to long term damage to the Gulf of Mexico from BP’s oil spill, the University of South Florida, the Coast Guard and even Ken Feinberg have offered their expert and not so expert opinions. The University of South Florida, in a recent study found layers of residue up to several centimeters thick in spots that span across several thousand miles of the seafloor and more importantly, in many of those spots the sea life that crawls across the sediment appears dead. Tests are beginning to show the residue is from BP’s Macondo well and the dead sea creatures are the bottom rung of the food chain in the Gulf. Their findings indicate the future impact is as yet unknown, and won’t be for some time. Incidentally, the NOAA has also been testing the sediment and found the oil in the sediment to be a match to the Macondo. A week after the release of USF’s findings, the Coast Guard also issued a report and surprise, it directly contradicts the university’s report, “We are not finding any recoverable amounts of oil” on the seafloor, Rear Adm. Paul Zukunft said. “We are dealing with barely detectable amounts of oil in the parts per billion in many places.” The parts per billion they could find, the Coast Guard was unable to link to the Macondo. They also stressed the report was not a conclusive analysis, but intended more as a guide for the Coast Guard and cleanup crews, not as an assessment of the spill’s damage to the ecosystem. Also needless to say, British Petroleum? They love themselves some Coast Guard reportage, “The scientific evidence in this report is consistent with our observations that the beaches are safe, the water is safe and the seafood is safe,” said Mike Utsler, BP’s cleanup commander. Kert Davies, director of research for the environmental group Greenpeace, fired back by saying Feinberg’s assessment is premature. “We’re talking about a very complex system, and it’s impossible to say there’s minimal long-term impact at this point,” Davies said. The University of South Florida stakes their science department’s reputation on their findings and stands by them. These findings indicate the oil is there and a lot of it is BP’s oil, sunk by the dispersants, and wherever that oily sediment is found it is killing off coral and the other sea life that forms the lower rungs of the food chain. They are continuing to study the long term ramifications. The Coast Guard, much like they appear unable to find oil when it is on the surface also can’t find it on the seafloor and then they strangely issue the caveat that their analysis shouldn’t be taken as conclusive. 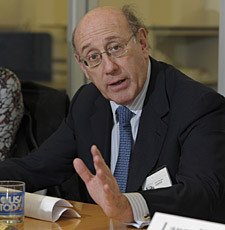 Ken Feinberg…well, he thinks things are looking rosier than ever and tells this to USA Today, a national publication, while also talking about his oil spill claim options and since things are looking pretty good, hey everybody, you should probably all choose the best option for you, so long as it is the two options that bar you from suing BP. Why would ya wanna sue BP? Things are good and getting better! And those pesky interim payments, that second option, well, since I’m the one deciding whether you are still suffering damages from the spill every three months and since I’ve indicated in the national press that it is my belief that things in the Gulf are shaping up, well take a guess whether I will be thinking three months, six months, nine months down the road that you are still suffering damages. In other words…take the money, now…no pressure. The University of South Florida, the ones without direct financial incentive, they might be wrong.